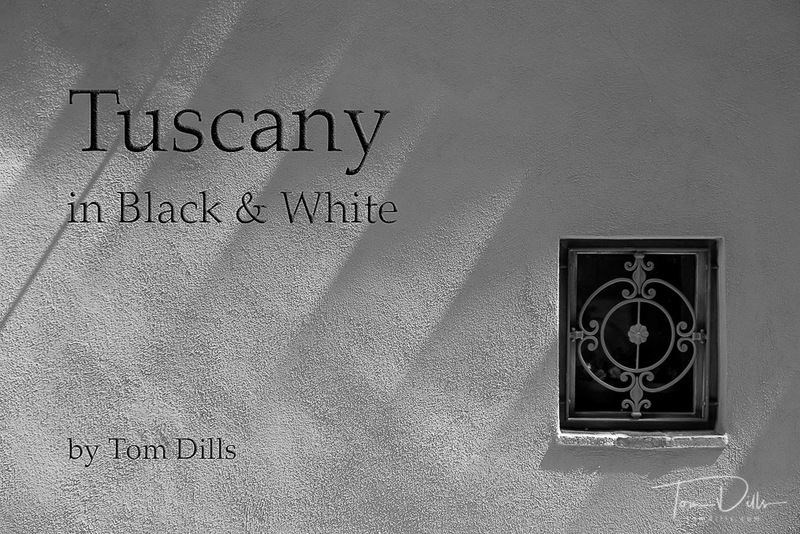 I posted previously about having made a slideshow of color photos from our Tuscany workshop. A personal project of mine has been to get better at seeing and photographing in Black & White. I recently created a separate slideshow to showcase my progress toward that goal. Link to video is below. Thanks to Jeff Curto for his encouraging feedback and for hosting the videos until I get my own Vimeo page set up! Oh, Wow! This is wonderful, Tom. Shadows, light, lines, patterns, architecture. All are good images for black and white. A great series, my friend. Did you shoot these in black and white jpeg or convert them from raw? I ask because you like shooting in raw. Again, awesome! Thank you, Monte! And that’s a great compliment coming from you, because I always admire your black & white photos! I sometimes set my camera to show the preview in black & white, but I always shoot in RAW and convert the file after the fact. It’s interesting, because several of the photos are completely ‘blah’ in color. The cover image, especially. I may need to make a post about that one in particular. I have yet to shoot any of my images from the Fujifilm cameras as my old version of LR will not see them. So I shoot some in black and white and some I shoot in color then convert in LR or Silver Efexs pro. Truthfully, these days I think there is less benefit to shooting RAW unless you really need to recover highlights or shadows. The baked-in profiles, especially in the Fuji cameras, are really good. Software like Lightroom – even older versions – does a really good job with contrast and saturation, etc. and even exposure within reason. I just bought the updated Nik collection and am looking forward to working with the various modules, including Silver Efex Pro. Thanks for the shout-out, Tom…. Back in the days when I was shooting a lot of film, I always thought about “the guy back in the darkroom” (me) who had to wrestle the negative or transparency into a print. The more information I gave that “darkroom guy,” the easier his job became. In the digital world, my thought is… “you never know” what the image is going to wind up as. You might conceive a set of images as B&W or color from the get-go, or you may need to choose that option later on in post-production. Or, you may figure that the images are only ever going to be screen-based – until you discover that you need a big print from the image. RAW files give you the maximum flexibility over your eventual outcomes. Your 2 cents are worth much more than that here and are much appreciated! I completely agree with shooting RAW and am an avid supporter for all the reasons you mentioned. The context behind the discussion that you don’t know about is that some time ago, Monte made a conscious decision to stop chasing the upgrade bandwagon and has now gotten to the point where his computer is too old to run the latest software which he needs to read the RAW files on his newer Fuji camera, etc., etc., etc. But he still takes great photos and wishes to continue! Of course there are other software tools available for reading newer RAW files, but software & hardware compatibility is a real problem that some folks have just gotten weary of. I believe that shooting JPEG is a viable option for those who are able to pretty much nail exposure and white balance, for those who just don’t want to be bothered processing their photos and for those who are not likely to need big prints. In some ways I see it as a print film vs. slide film discussion. For me (and I think for you!) the processing is almost as much fun as taking the photos in the first place but not everyone shares our passion! Good discussion and one I hope will continue…. Wonderful images, Tom, and beautiful conversion to monochrome – they certainly transport a mood of deep inner joy. Setting the electronic viewfinder to b&w is my preferred technique at the moment, too, and it helps me to concentrate on light and structures, whereas otherwise I might get too easily distracted by blaring colors. But I as well do always shoot raw, also because it liberates me at times of framing the image while at the same time giving the reassurance that there is a lot headroom in the highlights that gets clipped off in the viewfinder but especially in monochrome can easily be made use of. And the conversion mechanisms available now in the electronic darkroom allow a lot of the manipulations that would have requested filters in analog times, not only color filters but also ND-grads, which often do greatly improve my images. At the time of creating the image I certainly could do this as well, but it would certainly slow me down tremendously, which is not always an option when being in company. It’s great that we have so many choices these days, and being able to make many of them after the fact is a boon to our creativity. As you say, having to make decisions about color, filters and exposure in the field would surely take some of that away. The only filter I use these days is a polarizer, and it’s probably just a matter of time before there’s a software version of that! Great images Tom, so much monochrome goodness. I used to shoot Jpegs only, either colour or with one of the two B&W filters that I have in-camera, for no particular reason that I can recall, but I tend to shoot RAW exclusively these days. As everyone have pointed out, it affords far more control, especially when converting an image to monochrome. Oh, and by the way, I believe Luminar has a polariser filter though I am not sure how effective it is. I’ll need to check it out. I’m feeling pretty good about my results, although I admit to having much more to learn. Fortunately I’ve got some pretty good examples to follow. I’ve not heard of Luminar but will be interested to check it out. There’s a certain “magic” in black & white images which you’ve very nicely captured here! Like most of the others commented here I usually shoot RAW for all the reasons others have mentioned. There are occasions I might switch to JPEG if I need smaller and faster file storage and its inherent handling speed. Thank you Earl. I had a lot of good subject matter to work with…the magic was pretty easy!